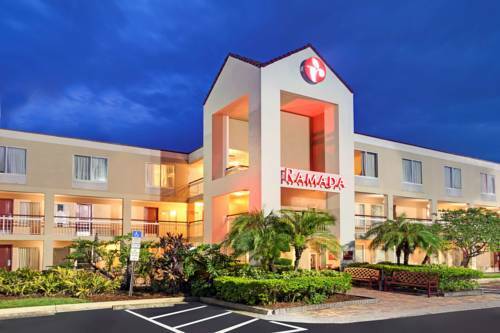 Ramada Orlando Near Convention Center is ideally located off International Drive, Orlandos Hub of shopping, dining, and entertainment. We are two blocks from Interstate 4 access and minutes from downtown Orlando. Our International drive location is close to I-Drive Trolley stops 17 and 18. If you prefer, we are walking distance to Shopping and Restaurants. Premium location close to Orange County Convention Center, Universal Studios, Wet N Wild, Sea World and World Class Shopping. For Business or Pleasure, our amenities add great value. Business Center, FREE Breakfast, FREE Wireless Internet, Microwave and Refrigerator in every room. Free use of the YMCA Aquatic Center to our guests. We have a board room that seats eight. Free parking. No pets allowed. Resort Fee of 4.50USD per night inclusive of all taxes is applicable for all reservations to provide the following amenities - Shuttle transportation to Universal Studios, Sea World and Walt Disney World Resort, High speed Wireless Internet Wi-Fi, Microwave and Refrigerator in all our guest rooms.